With 8 analogue voltage levels and only six logic functions, this left two unused functions so these have been used to provide a square wave generator. 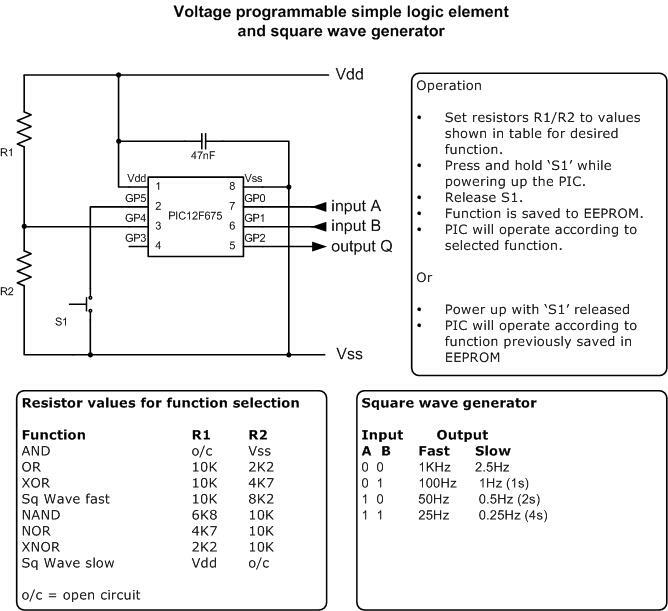 There are two modes, fast and slow selected by the voltage on the function select pin. Once selected the program reads the data on inputs A and B and sets the frequency on the output pin according to the table below. This is read each cycle so the frequency can be adjusted during operation. When the device is first powered up it reads the logic level on GPIO5. 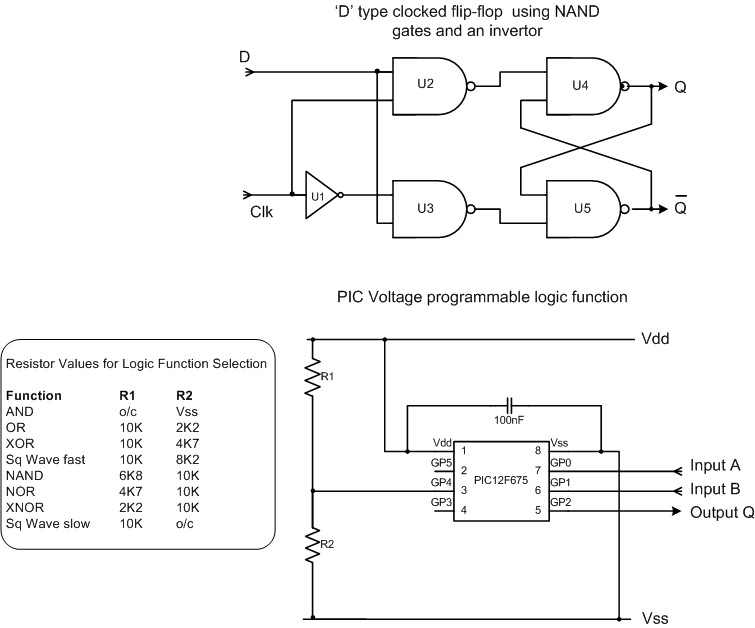 If the input is low, the analogue voltage on GPIO4 is sensed and the logic function determined as described above. The function selected is then saved to EEPROM. If the GPIO5 input is high when the device is powered up, the previously saved function is read from the EEPROM and used. In this case the analogue voltage on GPIO4 is ignored. This allows the function that the PIC will perform to be selected once and saved so it can be used repeatedly without having to set it each time the PIC is powered on. The inputs on pins GPIO0, 1 and 5 have the weak internal pull-up feature enabled so no external pull-up resistors are required. The code to emulate each logic function takes between 6 and 9 instruction cycles to execute. This makes the effective propagation delay between an input change and the output response around 6-9 micro seconds using the 4Mhz internal oscillator. While this is very slow compared to TTL logic for example, it's still quite practical for low speed circuits. In theory it should work up to about 100Khz. - I haven't tested it to this speed though. Aside from the logic function I've found the square wave generator very handy to have when experimenting with circuits on a breadboard. If you dig into the source code you can tune the frequencies to suit your own needs. The original version of this was application was written in May 2004. 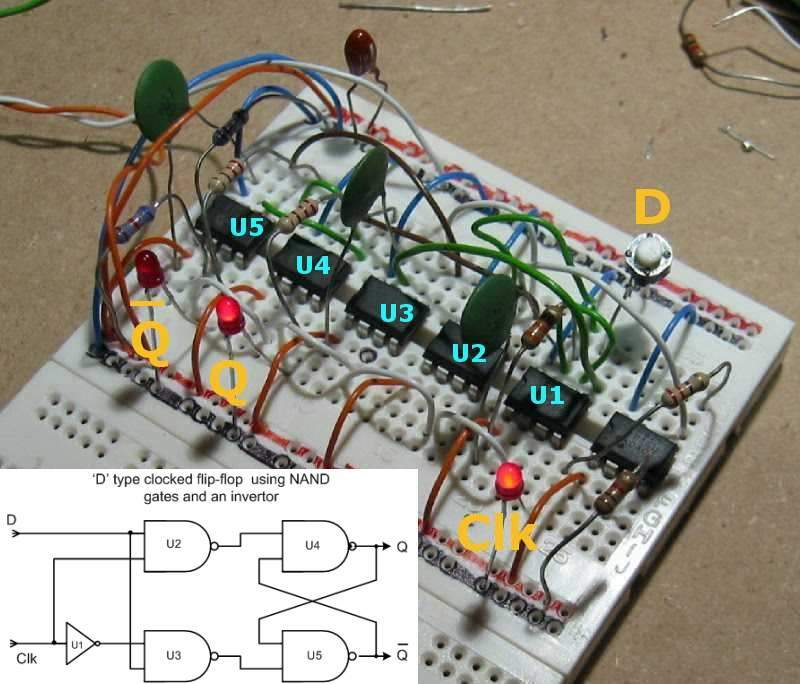 It doesn't have the save function to EEPROM feature and the code to implement the logic has an effective propagation delay of about 16 instructions (16 micro seconds @ 4Mhz clock). It also doesn't enable weak pull-ups on the inputs. I rewrote the code because the square wave function is quite handy when developing projects but having to have the resistors was a pain when working on the bread board so I added the programmable functionality to the code and took the opportunity to speed up the logic functions. The original code is available here but I recommend you use the version 2 code above. If you want multiple gates of the same type you only need one resistor network to set the voltage level and this can then be fed to several PICs in parallel since the input impedance on the A/D converter is quite high. In case it isn't obvious the propagation delay between input change and output will be in the order of 16uS so it's not going to replace high speed logic, but it does work really well as intended; for educational and teaching purposes in low speed circuits. One other point to be aware of, PIC's don't like their inputs left floating so drive it or tie it but don't float it. The version 1 code doesn't enable weak internal pull-up on the inputs so this is important.